Somalilandsun- Berbera the Sahil regional capital was a beehive of activities as the president of somaliland conducted inspection of several public institutions the whole of 19th November 2018. President Muse Bihi who is on his second day of an official tour saw him visit the National Oil terminal, oil laboratory, Marine Academy and the port of Berbera. This is according to a statement released by presidential spokesperson Mahmud Warsame Jama in which a Tugboat ride by the head of state and some members of his entourage is of note. Similarly the national fuel laboratory was also scene of similar activities by the presidential entourage. 'This state of the art Tugboat has eased not only the towing of shops to the harbour but servicing of those at sea waiting to dock at the Berbera port' said presidential spokesperson Mahmud Warsame Jama adding that its on board firefighting equipment enhances port safety. At the port proper President Bihi undertook an inspection tour that ensued with briefing by departmental heads and a candid tet 'a' tet with workers who informed of aspirations. Prior to consultation meeting with Management the head of state of official launch construction works for Berbera port extension being undertaken by Shafa Al Nahda company under contract from DP World which has a 30 year concession to manage the port worth $420m. During the first phase of development, both Mohamed and Allan Sanchez – project operations manager with DP World at the Berbera Port – said that a 430 meter berth is expected to be constructed which will accommodate two vessels at any given time. The overall expansion project will bring about a total of 800 meter wide berth that can dock five ships at a time. The existing port facility accommodates five major vessels on a 650 meter long berth. Addressing the expansion launch event president Bihi said 'As per the timeline, the port project is expected to be finalized by 2020' adding that The port facility, which currently has the capacity to handle 150,000 container port traffic (TEU: 20-foot equivalent unit), is expected to expand into handling one million TEU of 20 and 40-foot mixed units. Finally the head of state visited the national marine college where he inspected facilities and met with students before a briefing by management. 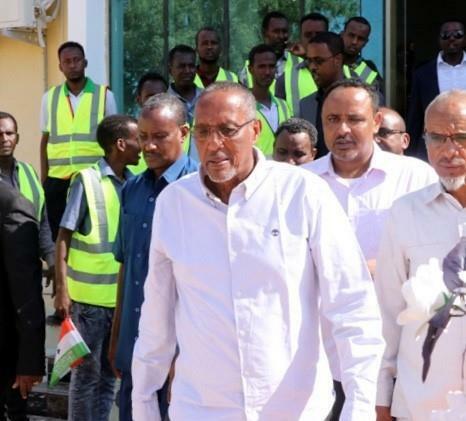 The presidential delegation is composed of senior ministers in his Administration, senior ruling Kulmiye party leaders as well as a number of prominent politicians.